Okay, settle in, get some snacks or something, because this might be a long one. It’s hard to believe it, but fifteen years ago today, Scholastic released Harry Potter and the Chamber of Secrets. This was around the time that I first got into the Harry Potter series, and even at only about eight, I devoured both Sorcerer’s Stone and Chamber of Secrets, and eagerly awaited the release of the next book, just like millions of kids around the world. Like I said, I was about eight when I first read Harry Potter, and I fell in love with it immediately. I had each book, as soon as it was released, and I would have it read within the week, most of the time less. I loved them. I loved the characters. I loved the world they lived in. So did almost everyone else that read them. Kids started reading because of these books. Kids that had never had an intrest in reading started reading because they fell in love with Harry Potter. That alone should say something about this series. Someone asked be awhile back, a non-Potter reader, obviously, asked me, in my opinion, what exactly was so good about Harry Potter. They’d seen some of the films, sure, but never read the books. FYI, not something you say to some Potter fans. Anyway, I rattled off the usual response to such a question: I gushed about the series and how great it is. ‘Because it’s Harry Potter, that’s why. How could it not be amazing. It’s Harry Potter!’ Where have you been the last 16 years, hm? so great? Is it the characters? Is it the story? Is it how it’s written? What is it about this series that has made it the success it is? What is it that’s pushed out more than 500 million copies of the books? What’s the reason it’s been translated into 70 different languages? Why do millions of children, teens, and adults adore this series? Well, I can’t answer for everyone else, but I can answer for myself. I grew up with this series. Harry would always be two years older than me, but it didn’t matter. As the series progressed, I grew up, and so did the characters. And so did the books, themselves. Sorcerer’s Stone and Chamber of Secrets were pretty firmly in the realm of children’s stories, but starting with Prisoner of Azkaban, things started getting progressivly darker. The series was growing up, but so were its readers. But I really believe that this was such a key part of the series. The characters were allowed to grow up. Harry Potter was not a stagnant universe. Things were always changing and the stakes were always rising; they had to grow up. And for that inital generation of fans, myself included, growing up with the characters, almost literally, was part of the charm. It was part of the magic. And it made you care about the characters. These weren’t new characters, thrown at you at the beginning of every book. And the characters felt real. Everyone of them, from Harry on down, had their strengths and weaknesses. They had their good points and charms, they had their faults and flaws. And when they let their flaws get ahead of them? There were consequences. They were human. They made mistakes. And you cared when they made mistakes. You hurt when they hurt. There were many times when I cried reading the books. “The Prince’s Tale”, anyone? That chapter hurt. And of course, the writing is excellent. The planning is incredible. Little throwaway lines in Sorcerer’s Stone become vital in Half-Blood Prince and Deathly Hallows. THAT takes some serious planning and attention to detail. And really, who, at 10 or 11, wouldn’t have wanted to find out that there was this whole other world, hidden from our everyday lives? A world of magic. A world that we could never have dreamed of, and all of the sudden, there it was. And then there were the movies. The movies can be a point of… contention among some of the fans, but I have to say that I’m a fan of the movies, through and through. I love that they kept the same actors/actresses throughout all of the movies, where absolutely possible. It added to the whole feel that you were growing up with the characters, because we got to see Daniel, Rupert, and Emma grow up too. It just added a little something extra to something that was already so special. I saw several of the movies in theaters, and the last three, Half-Blood Prince and Deathly Hallows, Pts. 1 & 2, I went to the midnight premieres for. And it was at one of those premieres, Deathly Hallows, pt. 2, that I had one of the most moving moments from my time in any fandom. When the title for the film came up, there was this overwhelming feeling of ‘This is the end. This is really the end.’ That thought nearly made me tear up then and there. And then, the end. “Hedwig’s Theme” playing over the credits. The first music we heard in the series was also the last. It was sad, but it felt so perfect. Everything had come full circle, and evrything was alright now. But it really felt like a chapter of my childhood was coming to a close. And in a way, it was. 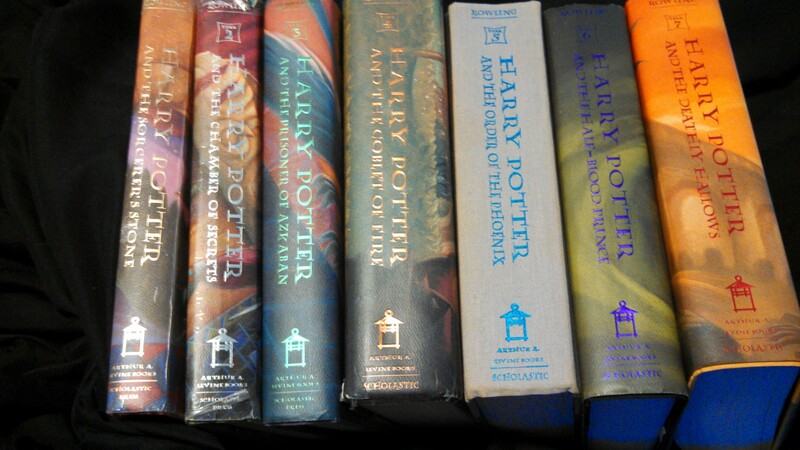 Harry Potter was such a part of my childhood and teen years. Harry Potter was something so many of my friends and I loved. We read it together and gushed over it together. I have such fun memories of guessing at future plots, discussing characters, and yes, I admit, fanning over pairings. I still totally ship Harry/Hermione. But it was fun. We enjoyed it, and that was what mattered. Ultimately, I feel like that was what Harry Potter was about: having fun. It was a world where anything was possible, and you were limited only by your imagination. I know all of this sounds like such a rambling, long-winded answer, but so be it. That’s my answer to why I love Harry Potter so much. Because I loved the characters. Because I loved the world. Because the writing was great. Because yes, it really was just that awesome. Thank you so much J.K. Rowling, for giving us this amazing world. Thank you for fifteen years worth of memories and fun. Thank you for giving us Harry Potter and his world.